Italian Beef Sandwiches and "I Yam What I Yam Fries"
“Please make me,” said the Italian Beef. You can make a bunch and feed a lot of people and make them all happy. You can feed just two of you and freeze some for later. 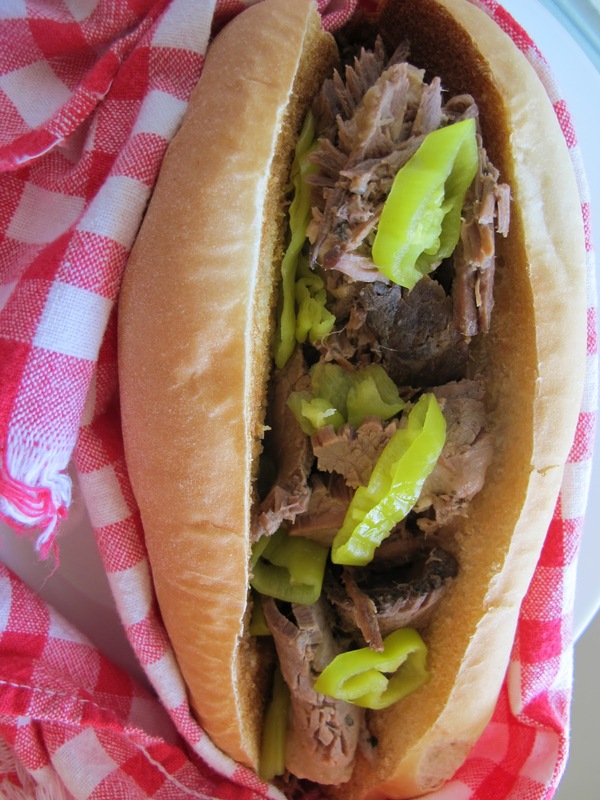 Whatever you do, just get a pot going and make this “I’m so happy I came” Italian Beef. Definitely a head-shaking, eye-rolling lip-smacker. You probably have the picture. Great for the weekend after Thanksgiving or the holiday office potluck. 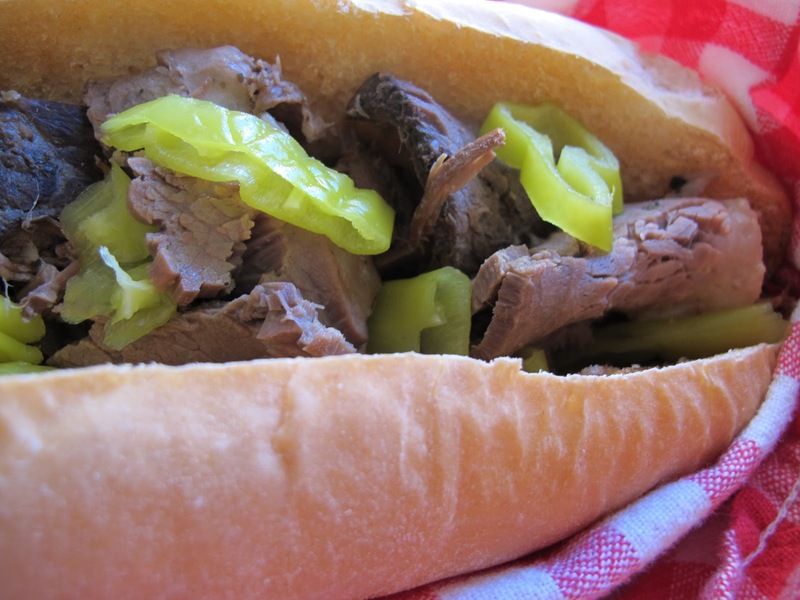 Is Italian beef really Italian? I’m not sure I know, but where I grew up in Chicago, it was sliced thinly with a bit of heat and a lot of spice and garlic, piled high on a great piece of baguette (we didn’t know that word; I’m sure we said ‘Italian bread’) and served with marinated vegetables (giardiniera) or maybe just pepperocini, which is what I prefer. I grew up eating this whenever I could get it and, when I got married, my mother-in-law proudly passed on her recipe. Over the years, it’s tweaked itself into something somewhat different….similar, but up the ladder a peg or two flavor-wise. My childhood Chicago version was wrapped in white paper or in white paper topped with aluminum foil if you were going far. Adored and consumed quickly while hot. If you waited too long to eat it, the juice (ah, the juice!) would seep into the bread’s deepest corners rendering a knife and fork necessary. Still good, but not exactly a sandwich anymore. And juice, lots of it, is a big part of THE Italian Beef Sandwich. 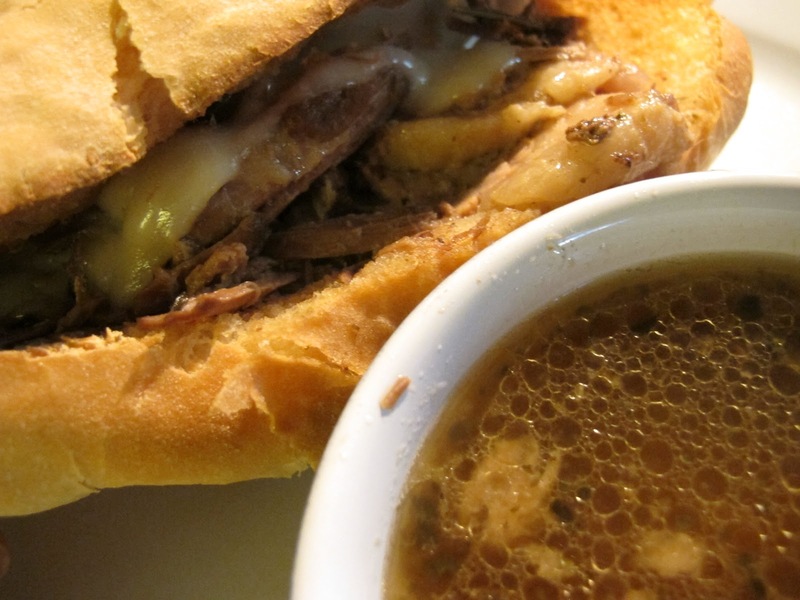 Think of French Dip without the dip. Ya gotta have it. I DO like to serve a small side bowl of this spicy broth for dipping in just the same way you serve the au jus for French dips. Cheese? If you must. Only provolone. Your choice about how to cook this beef. If you’re home, you might like it in the oven; its smells like heaven and people won’t be able to wait to eat what’s in there. “What smells so good in here?” will be the favorite line. Isn’t that what you want to hear? Teenagers might stay home for dinner. If you’re working, throw the mess in a crock-pot and come home able to say, “Dinner’s ready!” These are many people’s favorite words in life. Feel free to double or triple the recipe for either two pans in the oven, two crock-pots, or one counter top roaster, such as a Rival. (These come in a few sizes starting at 10 quarts) I purchased one for a frantic Thanksgiving a few years back and use it often as an over-sized crock-pot. At any rate, you then have enough to freeze a couple of meals ahead in two quart containers. Simply take one out in the morning of the day you require a do-nothing dinner, run it under hot water to pop it out and then place it in the large crock-pot that you’ve put a little water into. Turn to low and leave all day. Presto……….dinner. Add a little Caesar Salad on the side or try my “I Yam” oven yam fries; I’ve included the recipe after the one for the beef. Rub beef roast with salt, pepper and garlic. * Place in 6 qt crock-pot and cover with oregano, basil, marjoram and red pepper. Pour broth and wine over all and add celery and onion. Set crock-pot on low and cook 5-6 hours until tender (1 hr more at altitude) but not falling apart. (Or roast in oven, covered, at 350 about 4-5 hrs) To eat today: Remove beef from broth; let sit while you strain the broth, discarding celery and onions. Place a ladle full of strained broth in each of six small cups; return remainder to crock-pot. Slice beef thinly and add to broth in crock-pot. To eat later (best because the flavors marry overnight and you can slice cold meat more easily): Cool meat in strained broth; ; store in frig. Slice cold beef very thinly and return to covered pot. Re-heat gently in oven at 350 F for 30-40 min. Serve with toasted baguette or sliced Italian bread and pepperocini on plates with bowls of broth for dipping. Add provolone cheese to sandwich if desired. *At this point, you can brown the meat on all sides in a Dutch oven with a small amount of oil or bacon grease but, while this improves the taste, it is not absolutely necessary and adds 10-15 min. to the preparation time in the morning. Do it night before and have it ready to go if it makes a big difference for you. In a large bowl, toss cut yams with oil and spices. Spread out onto a large, rimmed baking sheet (2 if needed) and bake until crispy at ends–45 min to an hour. Do not over cook. Wine: Chianti or another inexpensive Italian red. Nothing pricey. Dessert: Pick up some cannolis if you have a source. If you have a pizzelle maker, you can make cannolis yourself. Or, for a group, spumoni and biscotti is a perfect ending. While we love to cook and share time with families and friends, it’s sometimes not so easy to think of how many people are hungry right now in our world. The current number stands at about 1 billion, 35.5 million of which are in the United States. In the U.S., 12.6 million, out of the 35.5 million, are children. 16,000 children die world-wide every day due to hunger-related causes. Each of us can begin, on our own, by not wasting food. In our world, statistics vary, but often quoted numbers note 25-30% of the food produced is thrown away. 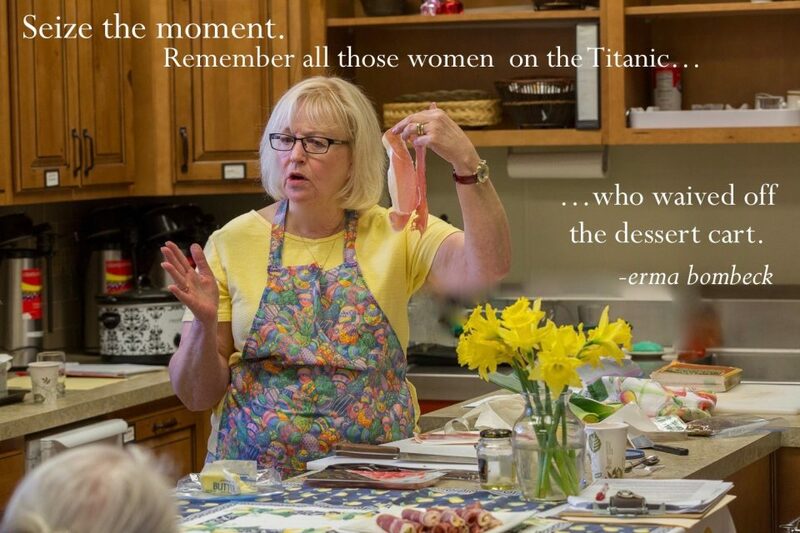 Volunteer at your local soup kitchen or food pantry. Keep the food in your own kitchen pantry up to date. Clean out your cabinets now and take the extra food to church or the local food pantry. Donate money there for meat, perishables and things food stamps don’t buy. Check out bread.org (website for Bread for the World, a Christian Voice for Ending Hunger) for facts and for ideas for helping in your community or place of worship. and check the listings under HUNGER for an organization you might want to support. Go to that website for information on donations or volunteering. What else? Comment here for thoughts to share with fellow cooks. It’s snowing outside my window and I am blessed indeed to be warm and well-fed. I had the great privilege to worship in a safe place and hear the Word brought beautifully. My family treated me to a birthday lunch out and what is better than sitting next to your grandson in a restaurant booth? When the cold winds blow and you’ve got two or ten that’ll be hungry, pull out this recipe. In fact, get a rump roast or two the next time you see them on sale. Freeze them and be ready to make this beef. 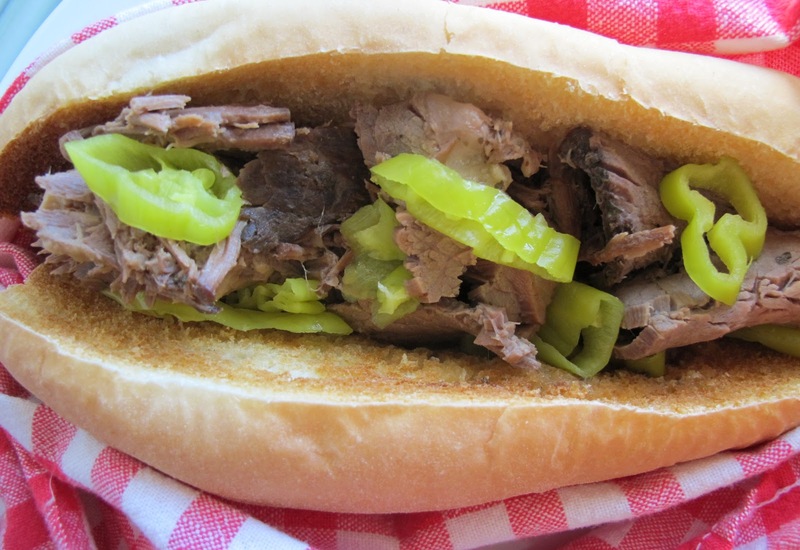 You won’t be sorry and.. you’ll be smiling as you draw the smell deeply into your nostrils and breathe…Italian Beef!